Grow your own spuds for the dinner table on your own patio, with no need for allotments or back-breaking digging. This complete kit includes 3 different varieties of seed potato, 3 heavy duty, re-usable Grow Pots for growing in and a 1kg pack of potato fertiliser so all you need to do is plant and water. The kit includes 3 premium seed potato varieties Rocket, Charlotte & Desiree perfect for roasting, mashing, boiling, chipping and more. Ready to harvest as little as 8-10 weeks from planting - weather permitting. Supplied as a complete collection including 3 x 30L Heavy Duty Grow Pots, 3 x 6 Pack Potatoes, 1 x 1kg Potato Fertiliser. Each one of these special kits includes 3 x 30 Litre Heavy Duty Pots, 3 varieties of Turbo Tubers x 6 tubers of each PLUS 1kg Of Organic Potato Fertiliser. This special technique has been used by professional growers for years, but now you can do the same at home! 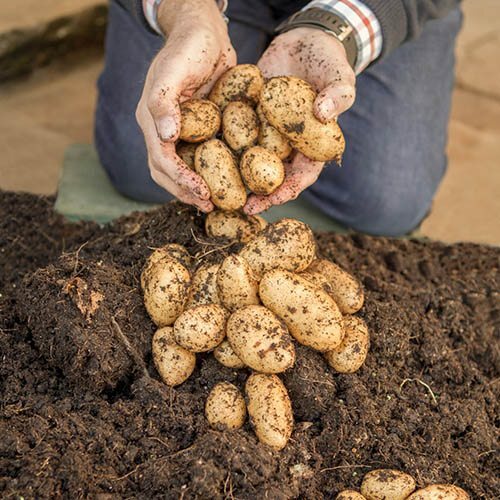 Plant them in early summer and keep them growing through to early autumn and then harvest fresh New potatoes from your patio anytime from October onwards. If you keep them frost free until December, you could even be eating tasty new potatoes with your Christmas dinner! Easy to grow all you need to add is compost and a little water. The 3 varieties of premium seed potatoes provided are Rocket, Desiree and Charlotte all trialled and tested to perform brilliantly as 2nd Croppers. Includes: 3 varieties of prime quality seed potatoes (each net contains 6 'Turbo' tubers), 3 Heavy Duty 30 Litre Pots and 1kg Organic Potato Fertiliser. Potatoes will be packed in the bottom pot, underneath the other two, in order to protect them. Note: Your seed potatoes will need chitting prior to planting. On receipt, stand them in an egg box in a cool, light room so they can begin chitting (shooting). Leave for 3-4 weeks, and short dark shoots (chits) will emerge. Take care not to damage these when handling or planting. Keep your potatoes well watered as they grow - dry conditions will result in a considerably reduced crop. Start with a little compost in the base of your container, about 6-7in (15-17cm). Place the tubers onto the compost and half fill the pot. Keep some horticultural fleece handy, should cold nights threaten. The green shoots will eventually poke up through the compost, and when they do, cover them with another layer of compost, water and feed. Keep on adding as the plants grow until you reach the top of the pot or bag. First and second earlies will grow quicker than maincrop potatoes which are in the pots for longer, so require more regular watering. In the ground, first earlies will take around 14 weeks to mature, second earlies around 16 weeks, but in warm containers you can knock a couple of weeks off that, particularly if you like to eat them small and tender. New potatoes are at their best eaten immediately, so pull out only what you want for one meal, leaving the rest to grow on.